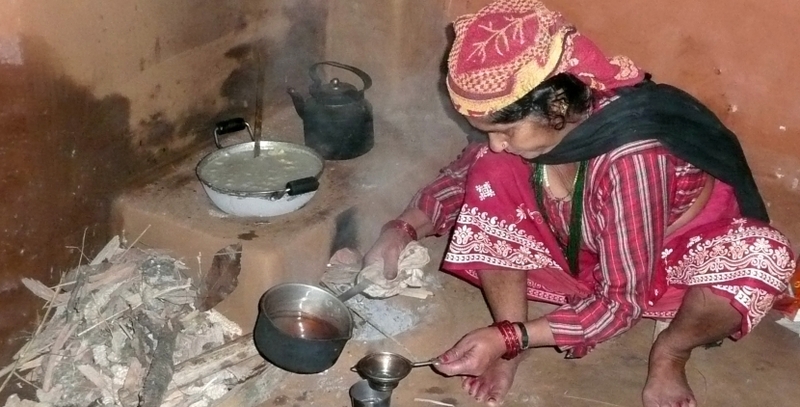 Nepal’s economic and social development is being hampered by its inadequate energy supply. The country does not have its own reserves of gas, coal or oil. Although its most significant energy resource is water, less than one percent of the potential 83,000 megawatts of hydropower is currently harnessed. Firewood is the predominant energy carrier, counting for more than 70 percent of consumption. However, its use is inefficient and poses a threat to the country’s forests. At the same time, the indoor pollution caused by open hearths in homes presents a hazard to health. Mains electricity is generally only available in urban areas and some 30 percent of the population do not have access to it (CBS 2011). The hydropower resources must be exploited in an environmentally sound manner. The energy generated should benefit small and micro businesses while improving the standard of living and the health of local people. It should contribute to the protection of forested areas and, by being fed into the national grid, should bring new revenue to the region. Compared with other countries, Nepal has a high energy consumption in relation to its gross domestic product (GDP). It does not yet have a strategy for sustainable, efficient energy use for either the electricity sector or its main primary energy source, biomass. The power supply is particularly critical during the dry season, during which it is cut off for several hours a day, which has a negative impact on business and private households. Private households, the public sector as well as commerce and industry sector are largely unaware of the economic and ecological advantages of efficient energy use. There are no standards for energy-saving domestic appliances, lighting or products and processes in industrial use. The energy sector is viewed as Nepal’s key sector with regard to future inclusive economic growth and the realisation development goals as formulated in government policy documents. Besides quantitative targets for electricity generation, transmission and distribution the Government reiterates its commitment to sector reforms and the promotion of private sector participation. Further priority is given to extend rural electrification and a commitment towards a more efficient use of energy. 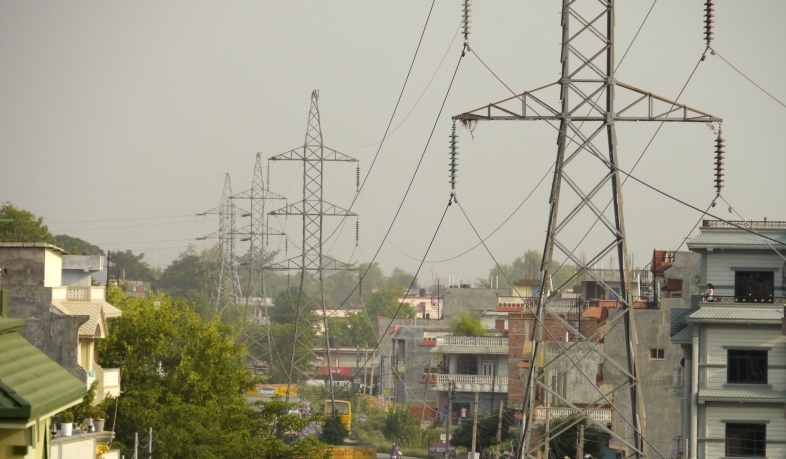 Despite continuous endeavors by the Government and support by the Development Partners the energy supply in Nepal is still insufficient, and a significant obstacle for the social and economic development of the country. Biomass is by far the most utilized primary energy source and the electrification rate of the popul ation is only about 70%, with approx. 63% in rural areas (CBS2011). 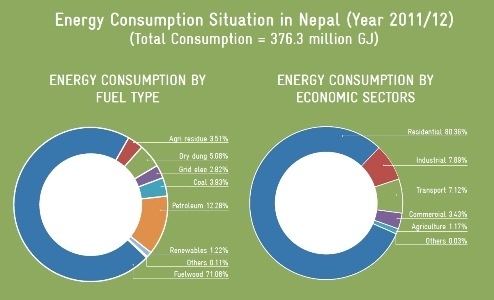 Nepal’s average annual per capita electricity consumption is about 161 kWh (CBS2013)– one of the lowest consumption in South Asia. Despite its vast hydropower potential, Nepal suffers from a severe and long-lasting electricity supply crisis. The framework conditions and incentives for private investments in power plants are not adequate and a non-cost-covering tariff system discourages efficient electricity use. Deferred investment in electricity infrastructure has caused scheduled power cuts of up to 16 hours per day during dry season. As this situation is expected to worsen in future, commercial and industrial entities increasingly operate costly diesel generators. The import of petroleum products has exceeded total exports and thereby contributes significantly to Nepal’s trade balance deficit. In the last decade dissemination of renewable energy in rural areas has been effectively promoted with assistance of the Development Partners. Decentralized electricity generation and biogas installations thereby improve rural living condition and contribute to a more sustainable use of biomass. Rising energy costs and prevailing energy scarcity increase attention to the efficient use of energy. Reasonable potentials for energy efficiency measures have been identified in industry and households as well as public infrastructure. WECS 2014, Energy Data Sheet, Water and Energy Commsission Secretariat (WECS), Government of Nepal, June 2014. CBS, 2011 Nepal Living Standards Survey 2010/11, Statistical Report Volume 1, Central Bureau of Statistics, National Planning Commission Secretariat, Government of Nepal.